Halpin's Flooring America is the flooring center where you’ll discover a variety of attractive, easy-to-clean waterproof floors in Prairieville, LA. Today’s busy homeowners are interested in stress-free flooring solutions that enhance home interiors without demanding much effort. The waterproof floors you’ll find here are ideal for active households with pets and kids. 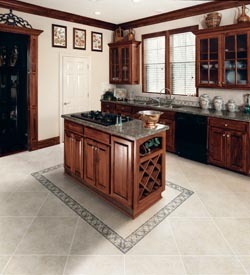 Resistant to stains and spills, these durable floors retain a like-new appearance even after long periods of heavy use. Visit our showroom today to explore our selection. With so many carpet and vinyl styles to choose from, you’re sure to find the right waterproof flooring for your home improvement project. With our waterproof materials, you receive tough, built-to-last flooring that doesn’t sacrifice its visual appeal. Consider our waterproof luxury vinyl planks: these gorgeous floors replicate the appearance of organic hardwood. But, they come with the extra advantage of exceptional resistance to moisture. Luxury vinyl is a flooring improvement that lets you enjoy the look of hardwood in any room of the house, even the kitchen and bathroom. We welcome you to come experience this popular flooring option at our showroom. The flooring experts who greet you at our store will steer you toward the best material for your project. With our waterproof carpets, you don’t have to let spilled drinks and pet accidents get you down. Our carpets come in pile thicknesses and colors to suit all preferences, and these carpets are the low-maintenance flooring material you will be glad you purchased. The carpets we feature are ideally suited for your home’s busiest rooms. Makeover your property’s interior with carpets that will look great for years to come. These popular floors let you get a taste of the easy life. Our inventory includes products manufactured by the industry’s most trusted brands, so you can rest assured that you are buying durable flooring materials. Our goal is to create a superior shopping experience from start to finish. Once you pick your favorite new flooring, our support doesn’t stop there. We send our professionals to you to make sure that your new water-resistant flooring receives correct installation. Properly installed, your floor will look and perform its best for longer. Let us show you what makes us the area’s most recommended flooring showroom. With our friendly and knowledgeable store associates, competitive pricing, and comprehensive collection of waterproof flooring and other styles, we stand apart as the showroom more residents prefer. Contact us for more information about waterproof flooring. We proudly serve customers from Prairieville, Louisiana, and the surrounding communities.